When configuring suitable screw piles for a project, our Engineers rely heavily on soil properties determined from geotechnical investigation. Often undertaking soil testing using the ABC Anchors soil test probe, or commissioning a full soil investigation (SI) report from a geotechnical engineering firm provides us with sufficient design information. On small projects, use of our soil test probe instead can significantly reduce the cost compared to an SI report and provide similar results for specification purposes. There are occasions however when pile testing is necessary to confirm our pile specifications. ABC Anchors was recently contacted by a Client looking to install screw piles for a residential project in close proximity to the Thames in London. From an initial review of the SI it was understood that the site was underlain by a thin layer of dense gravels, however the soil properties below this were not described in the report. Being London based, an area known for weak Clays, and with a site in such close proximity to a river; it was decided that the soil report could not be relied upon alone. 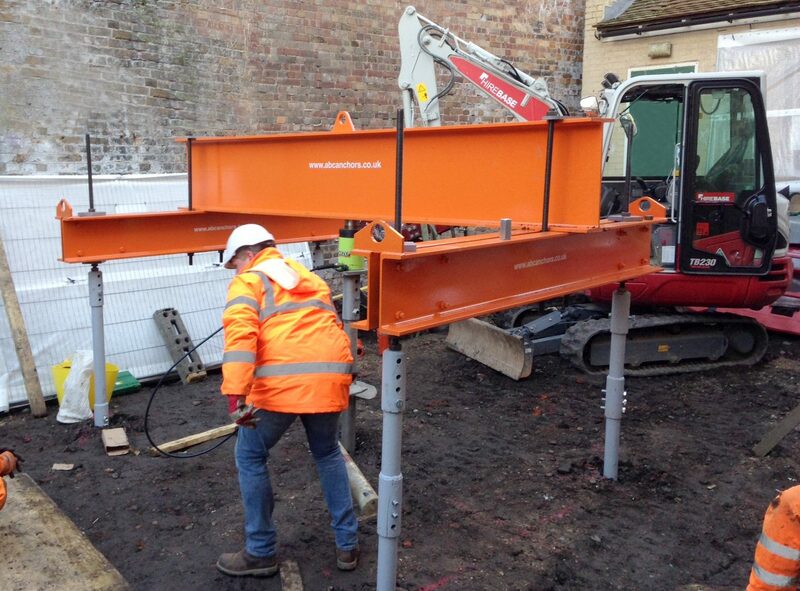 As the project required over 50 piles to be installed with design safe working loads of 20 tonnes per pile, it was critical to test the pile under load to confirm that any settlement was within acceptable limits. ABC Anchors installed an 89R test pile to an installation torque of 25kNm using our Autoguide 2500X torque head mounted on a 3 tonne excavator. Typically excavators between 5-10 tonnes are used to install piles of this size, however as the site access was restricted to a small alleyway only 1.5m wide, a 3 tonne excavator was the only option. It was a testament to our Engineering team’s ingenuity and the skill of our installers that installation torques of this magnitude were achieved using such a low powered machine. The pile was tested using our recently redesigned ABC Anchors testing equipment and experienced only 2mm of settlement when loaded to the pile’s ultimate load capacity of 62.5 tonnes. The Federation of Piling Specialists suggest that allowable settlement should be no more than 10mm under working loads. The testing was a complete success and confirmed the suitability of our 89R rock tip pile for the project.